Marriott Theatre has done it again, with world class casting, ingenious set design, and stellar storytelling. We were particularly impressed by the complex set which rises into the sizable skeleton of a covered bridge, and compacts into a rural home, complete with a full bed that rises from the floor. As always, they've risen to the challenges of designing for and blocking in their unique theatre in the round space. Creative use of screen projections behind the audience open the space out and add a sense of place. Jeff Award Winner Kathy Voytko steals the show as “Francesca”, bringing the audience along for the ride with her soaring vocals. The chemistry is palpable and intoxicating, with Jeff Award Winner Nathaniel Stampley as “Robert”. Wydetta Carter is another absolute stand out as nosey neighbor, “Marge”. We love her powerful solo that cleverly doubles as a radio backdrop for illicit romance. The tale of The Bridges of Madison County is passionate and heartbreaking, as love of family and longing for romance, travel and excitement clash. This is a classic tale of what ifs and roads not chosen. We were also left musing about what a different outcome would have likely resulted if the busybody neighbors had been more self righteous and vindictive, or if Francesca spilled her secrets. This is a delightfully entertaining and thought provoking musical with unexpected depth. This exciting exploration of human nature pits the irresistible tug of intense attractions versus the bond of parenthood. Obsession, destiny, decisions, morality, secrets, and lies make for a memorable storyline and a must see production this summer. Highly recommended. From the picturesque covered bridges of 1965 Winterset, Iowa, comes the Tony Award-winning Broadway musical, THE BRIDGES OF MADISON COUNTY, continuing Marriott Theatre’s spectacular 2017 Season, running June 21 through August 13, 2017 with a press opening on Wednesday, June 28 at 8 p.m. at 10 Marriott Drive, Lincolnshire. Featuring one of Broadway’s most accomplished creative teams with music and lyrics by three-time Tony Award-winning composer Jason Robert Brown and book by Pulitzer Prize-winning writer Marsha Norman, THE BRIDGES OF MADISON COUNTY first captured the nation’s heart as a best-selling novel by Robert James Waller and remains one of the most romantic stories ever written. Seven-time Jeff Award Winner Nick Bowling (Man of La Mancha, The King and I) returns to The Marriott Theatre to direct, with musical direction by Jeff Award Winner Ryan T. Nelson. A true sweeping romance, THE BRIDGES OF MADISON COUNTY is the heartbreaking and touching story of two people caught between duty and desire. A beautiful Italian war-bride who longs for the dreams of travel and excitement she once had as a girl, Francesca Johnson is a dedicated Iowa housewife living a simple, yet dispassionate life. When her family goes on a trip to the 1965 State Fair and leaves her behind to take care of the house, Francesca’s world is shattered as a ruggedly handsome National Geographic photographer, Robert Kincaid, pulls into her driveway seeking directions. A quick ride to photograph one of the famed covered bridges of Madison County sparks a soul-stirring, passionate affair for the couple, whose lives are forever altered by this chance encounter. Audiences will be swept away by Jason Robert Brown’s soulful score, drawing upon the rich textures of Americana and folk. THE BRIDGES OF MADISON COUNTY stars Jeff Award Winner Kathy Voytko as “Francesca” (The Marriott Theatre: Les Misérables; Chicago Shakespeare Theatre: Passion; Broadway: Oklahoma!, Nine, The Frogs, The Pirate Queen and Next to Normal); Jeff Award Winner Nathaniel Stampley as “Robert” (The Marriott Theatre: Man of La Mancha; Broadway/National Tour: The Gershwins’ Porgy and Bess; Broadway: The Color Purple and The Lion King; London: The Lion King; Apple Tree Theatre: Big River; Milwaukee Rep: Dreamgirls and Man of La Mancha); Bart Shatto as “Bud” (Broadway: Les Misérables, The Civil War, Dracula, Hands on a Hardbody; National Tours: Cats, The Civil War, Les Misérables); Wydetta Carter as “Marge” (The Marriott Theatre: Little Shop of Horrors); Terry Hamilton as “Charlie” (The Marriott Theatre: She Loves Me, How to Succeed in Business Without Really Trying, October Sky); Tanner Hake as “Michael”; Brooke MacDougal as “Carolyn”; and Emily Berman as “Marian” (World Premiere: Miss Bennet: Christmas at Pemberley at Northlight Theatre; Chicago Shakespeare Theatre: Sense and Sensibility). Also starring in THE BRIDGES OF MADISON COUNTY are Shea Coffman, Nick Cosgrove, Phoebe González, Allyson Graves, Johanna McKenzie Miller, Danni Smith and Brandon Springman. The production will feature set design by Jeff Kmiec, costume design by Sally Dolembo, lighting design by Jesse Klug, sound design by Bob Gilmartin, projections design by Anthony Churchill, properties design by Sally Weiss, and musical supervision and orchestra conducted by Patti Garwood. 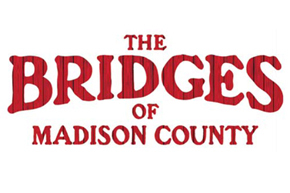 The performance schedule for THE BRIDGES OF MADISON COUNTY is Wednesdays at 1:00 p.m. and 8:00 p.m., Thursdays and Fridays at 8:00 p.m., Saturdays at 4:30 p.m. and 8:00 p.m., Sundays at 1:00 p.m. and 5:00 p.m., with select Thursday 1:00 p.m. shows. Ticket prices range from $50 to $60, including tax and handling fees. Call for student, senior and military discounts. On Wednesday and Thursday evenings there are a limited number of FREE dinners available with the purchase of a full-priced theatre ticket, which can only be purchased through the Marriott Theatre Box Office. To make a restaurant reservation, please call 847.634.0100. Free parking is available at all performances. To reserve tickets, please call The Marriott Theatre Box Office at 847.634.0200 or go to www.ticketmaster.com. Visit www.MarriottTheatre.com for more information.